If you’ve been paying attention than you know we’re right in the middle of posting an interview with that saucy minx, Amelia Tyler! I’m being mean and holding off a wee bit before posting the concluding piece- but to help tide you over, here’s a set of random questions I posed to her! 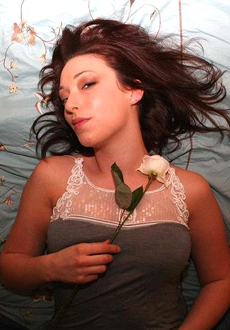 I posed similar questions to Tara Platt & Yuri Lowenthal in conjunction with my Action Flick Chick interview with them– they went over so well, it’s definitely going to be a regular thing here at NerdLush! NerdLush~ There can be no art without suffering. True or false? Amelia~ False, though I think suffering pushes us towards artistic expression far more strongly than happiness does – there’s nothing like a heady dose of the ‘I wish’es to make the brain start swimming with new ideas. I’m certainly loads more creative and prolific when I’m having a bit of a bad time. 1) Learn to speak French (properly, not just the menu ordering/Eddie Izzard mishmash I currently know). 2) Go skydiving (I’ve always been scared of heights and, while I’ve made a lot of progress already, I think that’d be the thing that’d finally push me into being totally over it). NerdLush~ What food would you recommend to someone to try even though you know there is something about it that would squick them, but you know they will actually love it? Amelia~ Pilchards with apricot jam. It’s one of my dad’s favourite ‘weird’ food inventions and it’s nummy. NerdLush~ What is your favorite color? Amelia~ Purple, but a slightly toned-down, greyish version. I love subtle jewel colours. NerdLush~ What is your favorite flower? Amelia~ Gladiola. So, so beautiful and exotic (almost enough to make me forget about the Edna Everage connection!). NerdLush~ What is your favorite bird? Amelia~ The Vogelkop Bowerbird. I first saw them on the BBC’s ‘Life of Birds’ and was totally transfixed. They’re pretty plain-looking things, but the males each build an incredibly beautiful hut (bower) that’s a gallery, not a nest. He then fills it with collections of items he’s found around the forest – brightly coloured flowers or iridescent beetle wingcases – all artfully arranged in his own particular style, then the female mates with the male whose artistic style is her favourite. Amazing. The dances that the various Birds of Paradise do are also highly amusing. Yeeeah, I watch a LOT of wildlife documentaries! NerdLush~ Who are your favorite poets? Amelia~ Shakespeare’s a big favourite of mine but I also adore the work of Carol Ann Duffy. 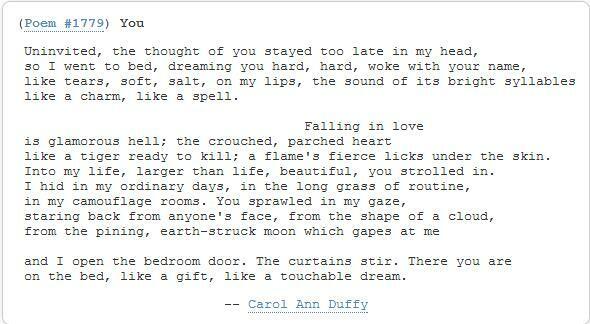 Her poem ‘You’ is one of my favourites in existence. For me it truly sums up the yearning and mental absorption caused by falling in love. NerdLush~ Who is your favorite hero of fiction? Amelia~ Does it have to be a hero? I’m not really a fan of traditional heroes – I much prefer a good, solid anti-hero. Han Solo is obviously a particular favourite and Ryan Reynolds as Hannibal King… well, he just makes me want to do very, very bad things to him! Also, if I can include heroines I’d say Lee from the movie The Secretary. I really admire anyone with the courage to fight their demons and recognise and stand up for what they truly want out of life. Amelia~ Pirates – absolutely no question about it. I like the attitude, the aesthetic and the sea air. I have to dress as a pirate wench soon for an upcoming role, actually. I’m looking forward to that like you wouldn’t believe! Amelia~ Both. Coffee in the morning (black), tea in the afternoon (white and one), decaf tea at night. I drink FAR too much caffeine. NerdLush~ Black & white or color? NerdLush~ Guitar Hero or Rock Band? Amelia~ Guitar Hero (I’ve never played Rock Band). I usually play it sat atop the big, silver exercise ball that I never use for exercise, bouncing to the beat. One of my proudest achievements was making it all the way through ‘Through The Fire And The Flames’. Now to master it on Expert! NerdLush~ Root beer or Dr. Pepper? Amelia~ I’ve never actually drunk root beer but Dr Pepper’s nummy (especially when you’ve got a bit of a sore head). Amelia~ Put those hands together, my friend! Now add prawns. If I absolutely had to choose, though, I’d say sweet. I’m a sucker for a carrot cake. NerdLush~ Scuba diving or sky diving? Amelia~ I’ve never been sky diving (yet!) but I went scuba diving in Tenerife once and absolutely adored it. I reckon I’d only ever go skydiving a few times in my life but, if I could, I’d scuba dive every day! Amelia~ Spring, but it only just beats Fall – they’re my two favourite seasons. Spring’s so full of promise and has that fresh, crisp air that makes me feel really alive. Autumn’s all crunchy and cosy and makes you want to just curl up inside with a mug of something warming and a hug. Lovely stuff!